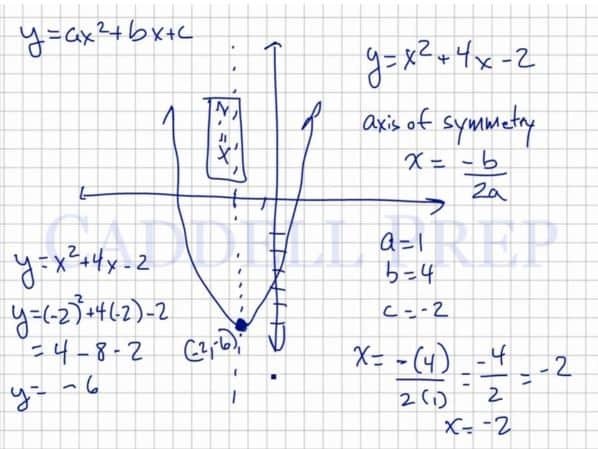 In this video, we are going to look at properties of quadratic functions. Quadratic functions are written in the form . The most basic one is . These functions are parabolas and are “U”-shaped. The point where it stops and changes to the other direction is known as the vertex. The axis of symmetry of the parabola passes through the vertex. A graphing calculator is a helpful tool when it comes to dealing with quadratic functions. After graphing the function, the vertex can sometimes be seen as a point on the table. The axis of symmetry has the equation of the x-coordinate of the vertex. In the function the table helped us determine that the vertex lies at (-2,-6). Without a graphing calculator, we can still find this information. In the function . When these values are substituted into the formula, we find that the axis of symmetry is at x=-2. Since the vertex is a point on the graph, we can use the original function and the x-value of the axis of symmetry to solve for the point where the vertex lies. This means that the vertex lies at the point (-2,-6), which agrees with the same point that we determined from the graphing calculator. Let’s go over properties of quadratic functions. The graph looks like a letter “U” and is symmetrical on the -axis. It can be anywhere in the graph or upside down. If you look at the line, it starts from the top then goes down and stops at a point then back up again. The point where it stops and turns the other direction is called a vertex. Also, the axis of symmetry is through the vertex. What about when the vertex is not on a particular tick mark? We might not know the exact numbers. But of course, there’s a way to solve it algebraically. Before we get to solving it algebraically, let’s do it first on a calculator. Let’s look at the graphing calculator. It goes down then stops and goes back up again. There’s the vertex – where it goes up and down on the axis of symmetry where it’s a reflector of the other side. The calculator already identified the values for us. Remember that the basic format for quadratic functions is . Now, how do we find the vertex? The vertex is a point on the graph. So we could use the function to find out this point. At this point, we know what is the value of . So how do we find out the value of ? Let’s use the function and substitute the value of . Just like the answer on the calculator earlier. Caddell Prep offers online test prep, web-based math assignments, and in-person tutoring and test prep. Disclaimer: Use of this website does not guarantee an increase in school grades, test performance, etc. * SAT is a registered trademark of the College Board, which was not involved in the production of, and does not endorse, this product. ** Test names are the trademarks of their respective owners, who are not affiliated with Caddell Prep LLC or Caddell Prep Inc.
© 2019 Caddell Prep. All Rights Reserved. * SAT is a registered trademark of the College Board, which was not involved in the production of, and does not endorse, this product. ** Test names are the trademarks of their respective owners, who are not affiliated with Caddell Prep LLC.